Following a notable 40-year career as CEO of several non-profit associations, Steven Hacker, CAE, FASAE, CEM is now the Principal of Bravo Management Group, an organization that provides strategic leadership, governance, marketing and event planning expertise to associations and trade show organizers around the world. 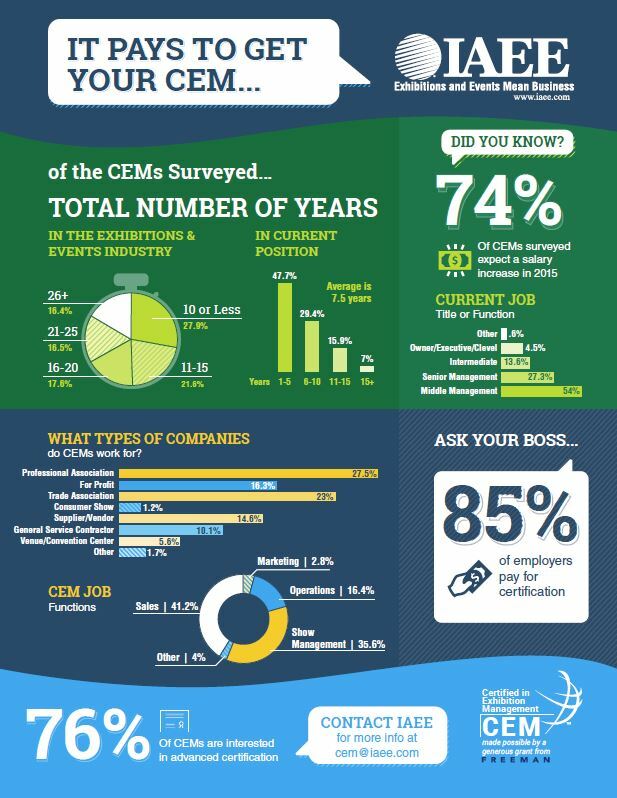 IAEE sat down with Steven to discuss why he joined the exhibitions and events industry and how the CEM program has helped shape his future. Steven began his association management career in 1970 and became involved in the exhibitions industry when he was hired as IAEE’s CEO in 1991. Steven’s continued involvement with IAEE and the CEM Learning Program stems from his personal involvement at IAEE and overseeing the development of the CEM program as it operates today. I stepped down as IAEE’s CEO in 2012 and began teaching CEM courses that same year. The 2017 CEM Learning Program course schedule is now available! There is no one memorable experience. Instead, I find that every time I present a CEM module, either face-to-face or online, I enjoy creating new relationships with students. The diversity of students, their very different reasons for studying the CEM program, and their unique personalities are enriching and energizing. I have met some really remarkable people thanks to the CEM program. Overcome the common fear of failure. Students are hungry for teachers who are committed to the program and who are willing to help them through the program. Perfection is not an expectation of students of their teachers, only a sincere commitment to helping them master their CEM studies. What are a few of the benefits of teaching CEM courses? Teaching CEM courses means that you need to constantly review the source materials, bring in outside resources, and keep your presentation techniques fresh and unique. I find that I have to prepare for each class by devoting three or four hours of preparation for each hour of presentation. I don’t mind doing this because it keeps my own knowledge fresh and contemporary. Things are always changing and teaching CEM courses is a great way to stay on top of things. Teaching the CEM program has given me a very intimate understanding of the challenges that students face. We need to remember that everyone in a class is employed in a demanding full-time career and many are also primary care givers, parents, and have additional obligations. Helping students understand how to keep up with their CEM work load is as important as providing the necessary motivation and information that teaching requires. I am still a serial volunteer. I am currently involved with other IAEE members and staff in several committees and task forces. I believe we grow every time we contribute to the group. Join Steven at Expo! Expo! in Anaheim for his campfire session on IAEE’s Certified Exhibition Program (12/07/16) and The Lawyers Are In: Hospitality Industry Attorneys Roundtable on Thursday (12/08/16).